I have 2 society chicks from my pair should be fledging next week. There were 3 chicks but one fell out of the nest. One is crested this pair has had 2 clutches before 4 chicks then 7 chicks now 2 chicks. I also have a pair of Cordon bleus in a cage by themsleves. Keeping my fingers crossed. More babies!! I am always excited to see what colors they turn out. I have tried to seperate my males but its hard when you go in to catch them and forget which one it was because I have so many. What kind of nest are they in? I used to use those small open nest and they get so crowded that one usually gets knocked out. How are the CordonBleus doing? Any signs yet of them mating or making a nest? I know they are harder to breed and follow thru with their babies and do not like any disturbance when they are nesting. I have them on my wish list. I have them in the large covered bamboo finch nest they have lots of room. The CB's seem to be doing fine I see him doing the mating dance and I have seen her mimick him. He has mated with her several times so eggs will follow soon I hope. Are the CordonBleus the same one you got in October? They are very pretty and I hope they bring you babies. Do you have them in their own cage so the other birds don't disturb their nest. Any luck with your Green Singers nesting? Yes the CB's are in a cage by themselves as are the GS. 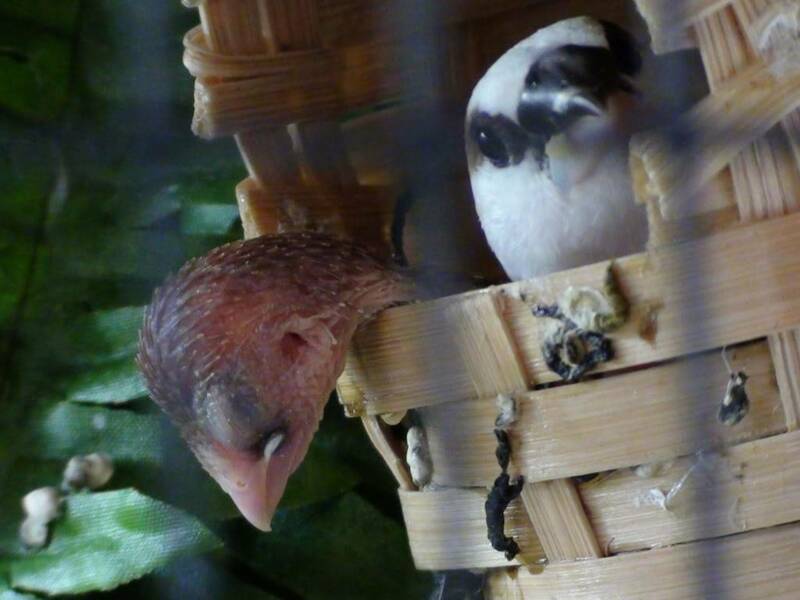 The only finches in the flight cage are the two male Gouldians, 2 Owls and 2 Orange Cheek Waxbills. I am looking at a pair of Silverbills to add to the flight cage. I was thinking about Shaftails but thought Silverbills would be more calm. The societies with their last clutch of 7 were in a small bamboo nest and it was so crowded in there the chicks were hanging out the front. I took the chance and moved the whole lot of them to a larger bamboo finch nest and luckily all went well. Here is a photo of the chicks hanging out. Out of that clutch I had 4 males all crested and two of those were pure white. I wish I would have kept some of them. Like I said the GS are in a cage by themselves now but before I had them separated and the male was loosing feathers like crazy. So they are together with a tube nest but they are still to young and skittish. Silverbills are calm and seem to get along with the other finches and I have read once they start breeding they breed like societies. I like the looks of the Shaft-tails but I know they can get pushy with the smaller finches but your avairy looks big enough to give them their own. But if they don't work out then you have to put them in another cage and you probably don't want more cages. That picture of your society hanging out of the nest reminds me of mine first society clutch they were so packed in their I thought the babies would get smashed. I even put two nests side by side but they all still piled in the one with the babies. I put an small box underneath the nest in case they fell out. That was before I move the whole group to a larger nest.